“Den Ekologiska Teatern” (The Ecological Theater) is a series of independent performative episodes in the utterly dead Biological museum in Stockholm. It is initiated by Anna Asplind and Daniel AlmgrenRecén and is happening throughout the spring and summer of 2015. “Den Ekologiska Teatern” will take the shape of a durational performative evening on the 25th of April, one publication named “Avlagringar”, that will be available in the museum and selected bookstores, a three month long participatory sound installation called “Mellan Lagren” (In Between the Layers) and a performance called “Kroppar i Mellanrum” (In Between Bodies). All centered on the artistic potential of the Biological museum. To do this “Den Ekologiska Teatern” invites International and Swedish artists from as diverse artistic expressions as written text, dance, fine art, installation, poetry, light and interactive sound art. There is also being developed new digital media solutions to explore this museums mausoleum of movement. The Biological Museum was inaugurated in 1893 in a three-way intersection between industrialization, nature romanticism and the climax of positivistic nature science. 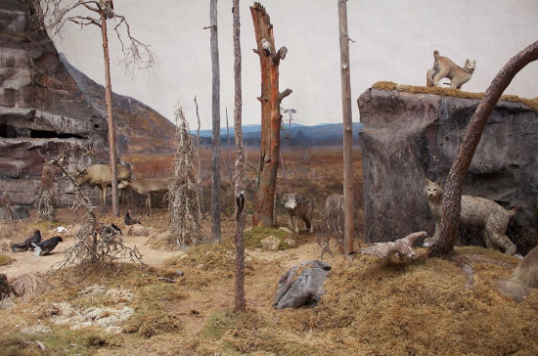 As a visitor in the museum, you find yourself in the midst of an harmonic nature scene filled with an large backdrop by Bruno Liljefors, a meticulously constructed environment by the taxidermist, hunter and amateur zoologist Gustaf Kolthoff and stuffed animals, shot, collected and conserved by the same man. The animals in their stagnated positions create, in contrast to the founder’s intention, situations far from the reality they were taken out of. The fact that a hare sits peacefully, only a few feet from a fox, is not very likely to happen in the forest. This distorted picture provides an experience of layered time, or even an absence of time, somewhere in between the living and the dead, as if a number of photographic negatives would have been multiply exposed on to the museum. What are then the stories that are being provoked in this place where the only living are the bugs that try to feed on the dead and an occasional sparrow that lost its way in the daylight that showers the silence? 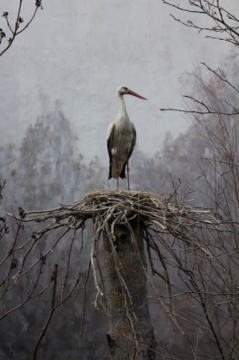 What is the animal’s reflection on the time and the society that is changing around them? Who is actually looking at whom? Who has the right to tell the story and whose reality is being told? “Den Ekologiska Teatern” is the first joint work of Anna Asplind and Daniel AlmgrenRecén. 25 March 6-8pm: “The Biological Museum as hunting trophy, and its future purpose and pleasure” Talk at the museum. Den Ekologiska Teatern’s dance performance taking place in the habitat diorama of the Biological museum (limited audience). Through his work AlmgrenRecén is investigating materiality, memory and belonging in the forms of installation and performance. In 2012 he travelled 7000 km by car with all his personal belongings and built up his home in several places along the way. Visitors were invited to this permanently temporary home for a cup of coffee and talk about their notions of home. Daniel is a graduate from SNDO at the Amsterdam School of the Arts and has studied Theology and Drama at the University of Gothenburg. He is systematically problematizing choreography as creative practice by looking in to the fields of education, management, architecture and design thinking. During the autumn of 2014 he was a guest teacher in Theaterwissenschaft at Freie Universität in Berlin and performed for the visual artist Christian Falsnaes at the exhibition “Vertigo of reality” in Akademie der Künste. In 2013 he created the work “Near That Place” together with Johan Forsman for Turneslingan tre scener, co-produced with MDT, Atalante in Gothenburg and Dansstationen in Malmö. In Asplind’s earlier work she has been engaged in the investigation on dance in relation to perception and understanding of different places. Since 2009 she has been working with a serie called “Dancewalks”, which is a site specific dance installation that has been produced in several public and semi public spaces throughout Europe. In this work she invites the audience to experience space through their bodies with instructions from an audio guide. In relation to her bachelor’s degree in Human Geography (2014) she successfully introduced this work to architecture and city planning. Last year she worked with the Dutch based company Random Collision in a close collaboration with the institution of social psychology at the University of Groningen. The piece was a part of a study in how groups form and affect each other and was presented throughout Moving Future festival and Norderzoon. Asplind graduated from the Ballet Academy of Gothenburg in 2008. Initiated by Daniel AlmgrenRecén and Anna Asplind. Co-produced with MDT and The Biological museum in Stockholm. Supported by: Kulturbryggan, Innovativ kultur, Swedish Arts Council, City of Stockholm, Swedish Arts Grants Committee.